Absolute beachfront holiday home with unobstructed "million dollar' views of the bay and sandy beach. Sitting on our shaded verandah you will enjoy superb sunsets across the Bay and an endless parade of passing boats. You can relax and re-energise with nature at your door. Furnished to a high standard, with your comfort and enjoyment a priority, our spacious 3 bedroom holiday home is fully fenced/gated on a flat section. Your children can play safely at the house or nearby reserve. From the Bay Retreat you have access to a safe, sandy swimming beach only metres from the house. You can swim all day regardless of changing tides. Tapeka beach has its own boat ramp and diving pontoon. For your families enjoyment we provide you with a pool table, table tennis table, a variety of sports equipment, including two kayaks, dinghy, toys and games. Tennis players have access to tennis courts in Russell township. Golfers can test their skills at Waitangi and Kerikeri golf courses. In front of the property there is registered boat mooring available for an up to 10 metre boat. Only two minutes away is the delightful colonial village, Russell. Here history and present day meld together offering a variety of local shopping, tourist activities, vineyards, a good selection of restaurants and cafes. The Bay Retreat is a warm haven in winter. A great place for you to relax and unwind all year around. Good 4G Mobile Data coverage for Spark, Skinny, Vodafone and 2Degress. Bookings for four nights or less are by negotiation.Special rates for Long-term and School/Stat holidays. Email now for colour brochure. Pets allowed with prior approval. Special rates for school holidays. Extras: Duvets/blankets and pillows are provided with Holiday Home. Bach owners Barry and Diana Ayling .We live in Auckland. We purchased this Holiday Home for Family Holidays and it has delivered great holidays and fabulous memories. We always enjoyed holidaying in Russell. 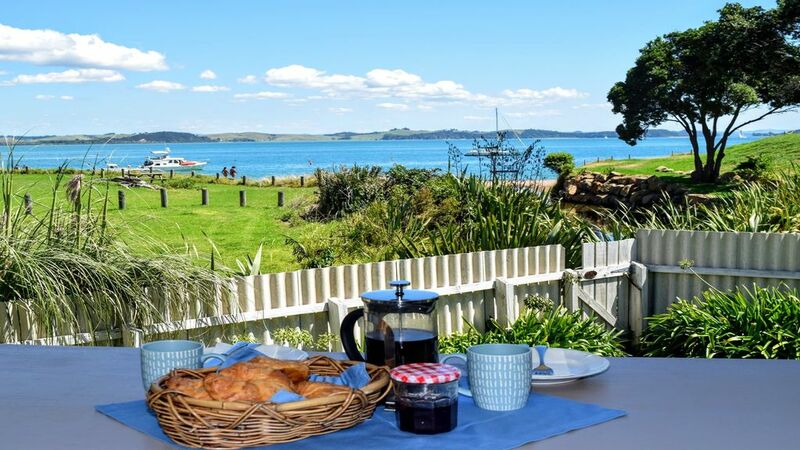 It is the gateway to the Bay of Islands, which is a very special place of the World. The Bay Retreat is so well positioned to the Beach and the Sunshine, yet is sheltered. The views are enchanting. From the Bay Retreat you have access to a safe sandy swimming beach only metres from the house. The Township of Russell just over the hill, 2 mins by car. Bathroom 1 Features: combination tub/shower Notes: Separate toilet. Absolute beachfront holiday home with unobstructed "million dollar" views of the bay & sandy beach. From our shaded verandah you will enjoy superb sunsets across the bay & a parade of passing boats. Well supplied with electric heating. Gargage has Table Tennis, Pool Table, life jackets and some sports gear for use. No vechicle access. No in-house Internet. Good phone data coverage and Internet cafe in Russell. Large lounge/living room with sea-views. Well equipped with modern appliances. Free-view channels, sorry will not take sky decoders. Selection of Cds, and connection for ipods etc. Sea kayaks, dinghy (rowboat), life jackets. perfect spot for relaxing ,swimming ,fishing would recommend ! Thoroughly enjoyed our stay. Lovely Bach, wonderful location! Would love to come again at some point in the future! Perfect location with an amazing view! Perfect location with an amazing view! Very family friendly and cozy home!! We will definitely be back! Have stayed three times now and LOVE it - fantastic location and a really comfortable homely bach. Will definitely be back! THANKS SO MUCH. Lovely location, the bay is peaceful yet within easy reach of Russell town. The property is really well equipped and has a wonderful atmosphere - it is obviously a well loved home. We really hope to go back. This property is everything it is described to be and much more! We had a fantastic stay at Tapeka Point. This property offers everything we needed, and in fact we were so fortunate with the weather we did not need to use the indoor entertainment, the pool table and the table tennis, and all the board games provided. Access to the beach is simple, and if anything the property seems closer to the beach than the photos suggest. The house was extremely clean and well presented and yet still had a homely feel to it. I can not recommend it highly enough. As tourists from overseas, we enjoyed our time spent in Russell which really is just 5 minutes away and we enjoyed the restaurants and fishing and site seeing charters, but Tapeka Point itself is so peaceful and quiet, and waking up to the view from the bedrooms, and the bird noise is quite an experience. We were not there on a weekend day, but despite the excellent weather we were often the only people on the beach. I have literally urged others to get up there and enjoy a week at this property, at this location, and will continue to do so. If it looks like the sort of place you will enjoy then book with total confidence. Thanks for review. Welcome back anytime. Russell village is one of the world's best kept secrets, with a variety of tourist activities, fine restaurants, and cafes. Russell is a 2 min. drive/12 min. walk from the Bay Retreat.